Neil Shubin has great credentials. He runs The Field Museum in Chicago, is a professor of anatomy and associate dean at the University of Chicago, and is famous as a paleontologist for having in 2006 discovered Tiktaalik, the missing link between fish and amphibians. He is also, it turns out, a very fine writer. This book, which he wrote in 2008, is one of my favorite explanations of science for the layperson. Shubin is a born teacher, always using what we know to lead us to what he wants us to understand. 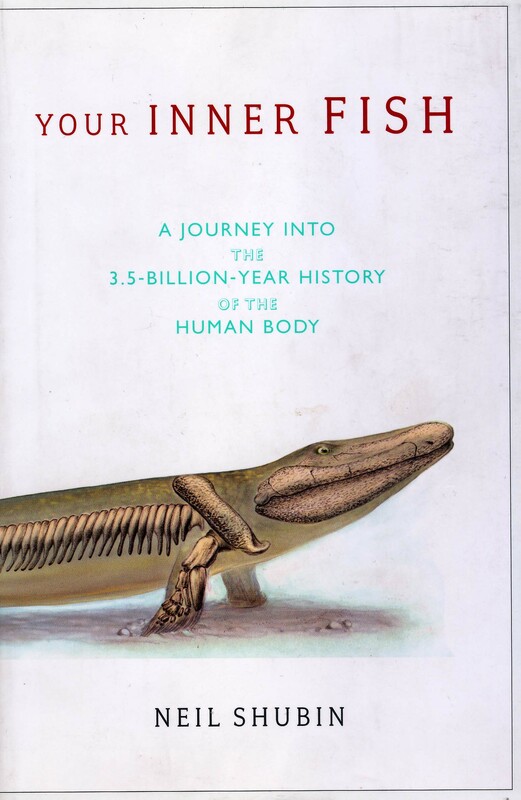 In this book he sets himself a task that few scientists would dare to tackle: telling the story of human evolution by looking not at fossil bones, but at the organs of the body. 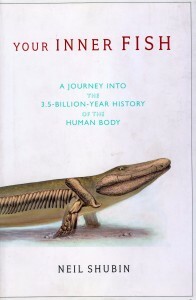 He traces the organs of the human body back millions of years, long before the first animals walked the earth. He discusses how our hands evolved from fish fins, how our head is organized like the of a long-extinct jawless fish, and how major parts of the human genome look and function like those of worms and bacteria. The human story Shubin tells starts billions of years ago, and gains much of its present core back 375 million years ago, as fish evolved the ability to escape the oceans of earth. Evolution didn’t simply replace all that highly successful innovation in this transition. Like adding new layers of paint over old, evolution improved on what was there – and if you look carefully, you can still see traces of the earlier coats of paint – your inner fish.